I suppose that Sean will always be known as the boy of "Sean and Rocky". 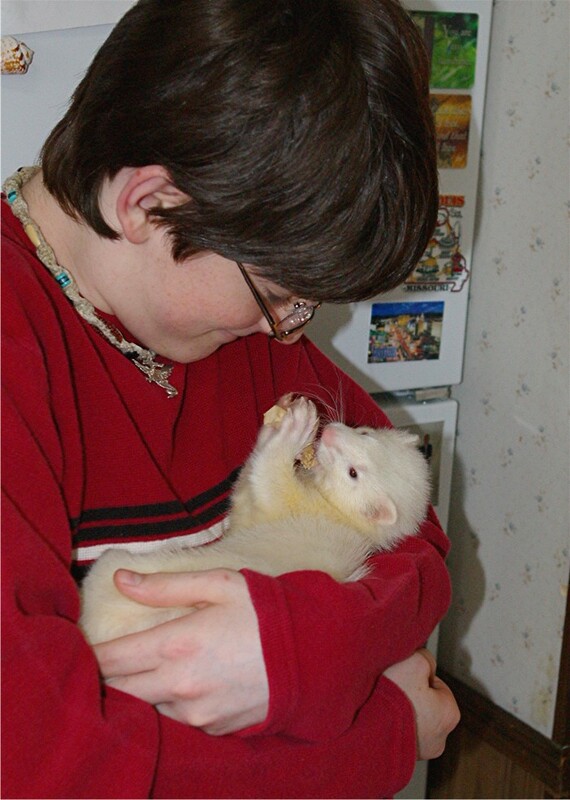 After his ferret, Rocky, passed away, quite a few saddened people wrote me and asked me not to let Rocky's death be the last chapter ... to never write the last chapter. I know that as someone who loved and cared for Rocky, I'll never forget that magical relationship that in part led to my little boy's miraculous emergence from autism. And I surely don't want the story to end, and I must admit that I cling to their memory quite a bit. But we do move on. And whether we all were/are ready to move on or not, Sean has. Perhaps one of Sean's most normal times in his life occurred when Rocky died. It was the healthiest I've ever seen Sean, emotionally and socially. He grieved, but he also cherishes Rocky's memory. He still tells story's about "King Rocky" (a character in a little book he wrote). And he stops and smiles at Rocky's photo's and movies without sadness. The real legacy of Sean and Rocky is just this: that Sean was able to grow up and then to move on after his loss. 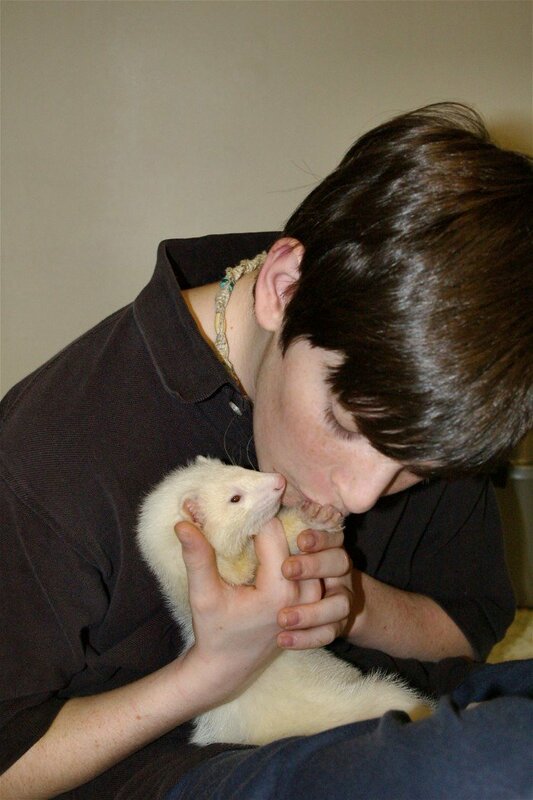 Sean was able to move onto a more normal relationship with an animal. I'm sure that is what Rocky would want. And it is indeed what all of us, who love Sean, wanted and worked so very hard for. Sean chose to buy a ferret just like any other boy. No searching. 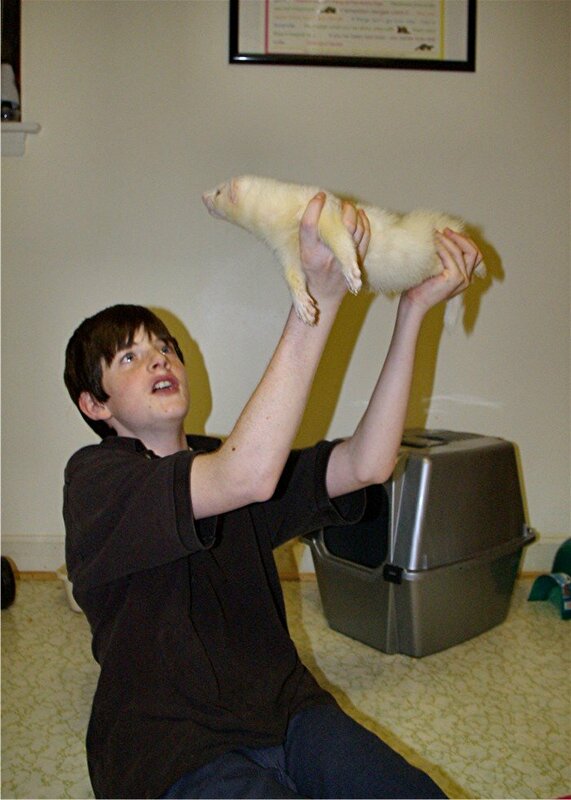 No raising a private bred ferret. No special little soul from a shelter. He simply chose a day to get a ferret, walked into a pet store, and picked out a regular pet store baby ferret and brought him home. 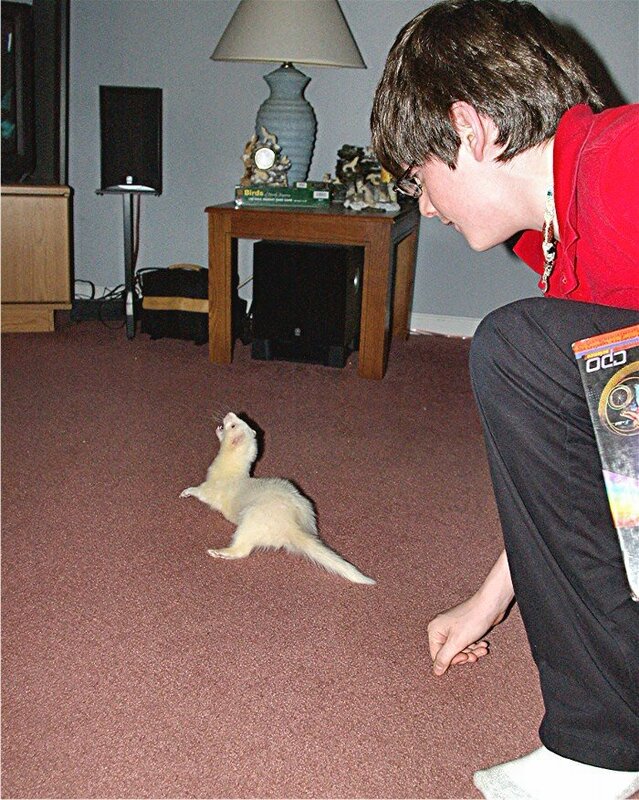 Pharos is a dark eyed white ferret full of energy. 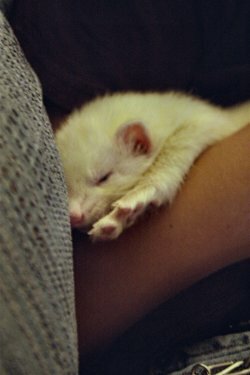 He is very pretty ferret that is solidly built and chunky. Sean could not escape something with special needs finding him, however. Fate has it that Pharos is deaf. But don't tell Pharos that. All Pharos needs to know is that if he climbs up Sean's leg enough he'll be lifted up high and swung around like Superman. Pharos the White Wonder, is what Sean shouts as he "makes him fly". Sean, now a fourteen year old teenager, goes about his day doing normal things that teenagers do: video gaming, playing music, and sprucing up in the bathroom. 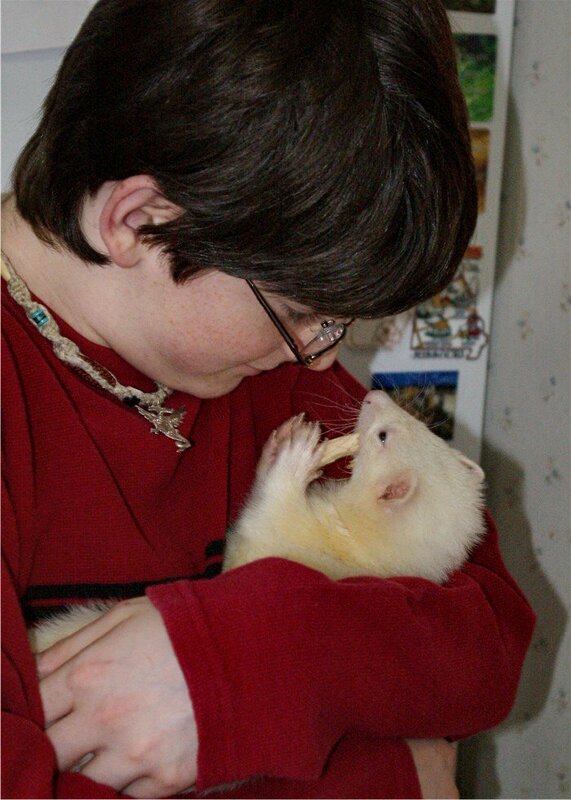 His new little ferret, named Pharos, "helps" him with his daily activities like homework, practicing coronet for band, and sprucing up in the bathroom. 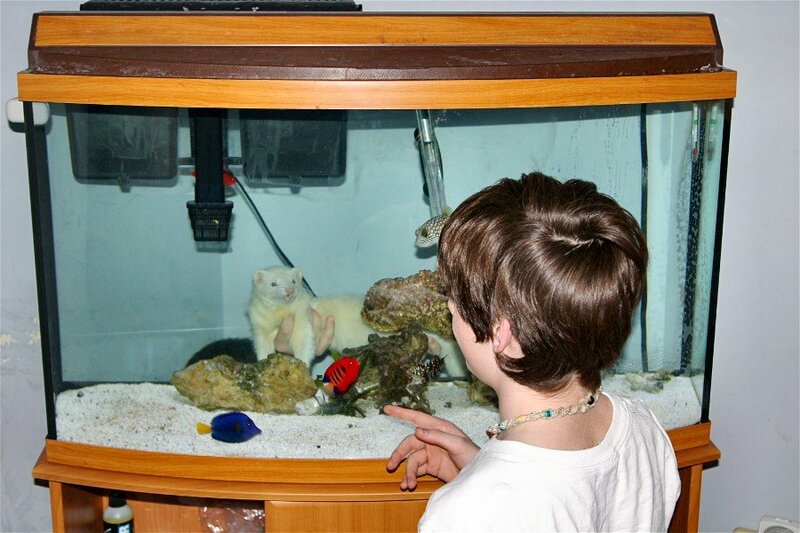 People write and ask me, "What's going on with Sean and his new little ferret Pharos? You never talk about them or write about them and I really want to hear about them." I feel bad. Because of me, many people fell in love with Sean from afar. And now I've virtually cut them off after Rocky's death. I don't mean to. And I really do try to supply photos and stories. But it's very difficult. But for very good reasons. Let me explain. I told a deaf friend that I have to make a conscious effort to write about Sean and his Pharos and this is why: I compare the two very different relationships with the weather. A storm comes along and you can rattle off descriptions galore from the top of your head. A storm is chaotic and changing every minute. Things jump right out at you in your face. Hail. Wind. Thunder. The smell of rain. And the moving, black, contrasting clouds. Everything. You get used to it's wonder, ignore the danger, and appreciate even all of the negative things about it. And it's so exciting you just want to share the experience with people even if it's not normal or is dangerous. But then, alas, a pretty day comes along. A day with blue skies and fluffy clouds. 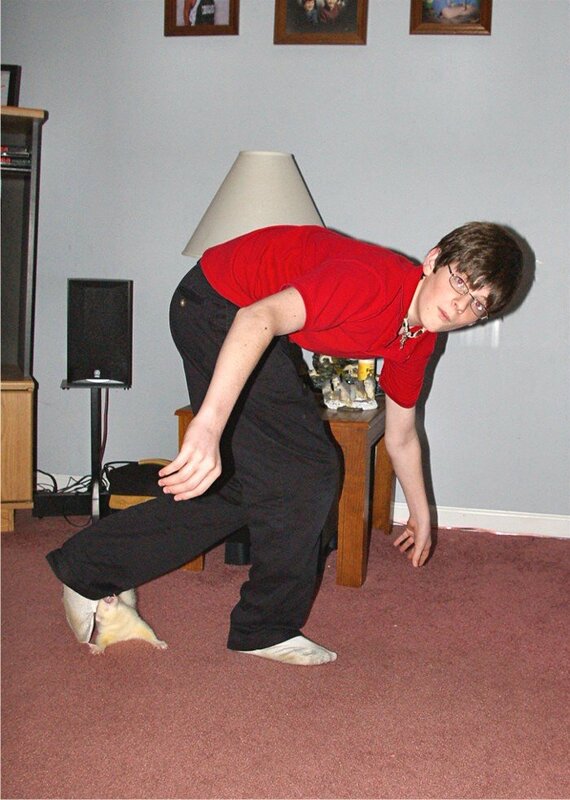 It's normal. It's common. It's safe. It's beautiful. But you take it for granted and it's so peaceful you don't think or talk about it much. You have to consciously make yourself look at it and enjoy the details of its splendor. Just like the old phrase, "stop and take time to smell the roses". We all have to remind ourselves to. Well ... that's what I feel like with Sean's two relationships. 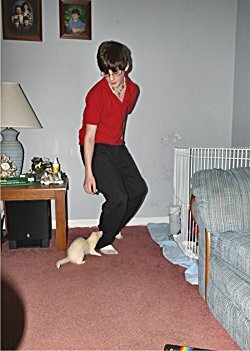 The storm of Sean's severe autism and his saving grace, Rocky, coming into his life happened in another place and time. Today's experience with a young man emerging from autism and his relationship with his new pet ferret is very average. I have to really "look" to see Sean and Pharos as opposed to the striking event that was Sean and Rocky which was in my face. Sean is like a typical kid ... well, not really. But almost. And Pharos is a typical kit ... really. 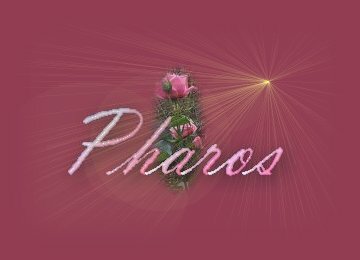 So this page is just not just for Sean and Pharos and not just for the people who love them. This is also for me. 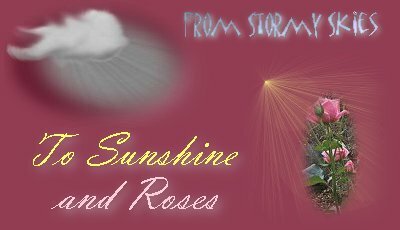 So that I can stop and "smell the roses". And to heal and move on ... just like Sean.